Jenny worked in the marketing and community relations field for eight years before she decided to stay at home after the birth of her first son. She continued to stay at home and raise her three children (2 boys, 1 girl) for nearly nine years. 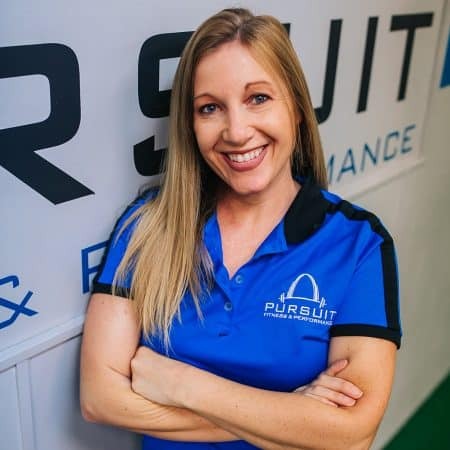 She jumped at the opportunity to transition back into the workforce by joining the Pursuit Fitness and Performance team. She enjoys exercising, volunteering at her children’s school, making music playlists for friends, and spending time with her family. She knows first-hand how important fitness and health is to our bodies. She was diagnosed with Guillain Barre Syndrome in January 2017 and lost the ability to move her body from the neck down. Her recovery was accelerated by the strength training she received as an active member of Pursuit Fitness and Performance.